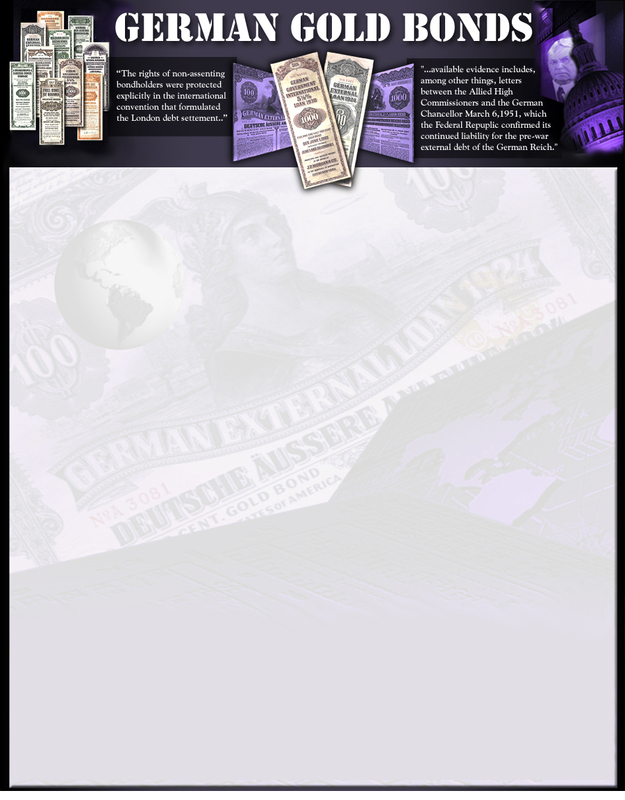 "The German Financial Time Bomb"
The first book, “The German Financial Time Bomb”, carefully detailed the story of how Americans were conned into buying hundreds of millions of dollars worth of German Bonds in the 1920's and how those bonds were defaulted on in the 1930's. It then explained how Germany deceived the world in the 1950's into thinking that they would take responsibility to repay the old bonds sometime in the 1990's. As of 1994, the holders of these old German Bonds were finally permitted, by law, to demand payment on these debts that were legally frozen for decades. However, since 1994, forces within the German and US Governments have colluded to deprive bondholders of their rights to collect on these debts which (with accrued interest and adjustment for the current price of gold) may now represent as much as $1 Trillion dollars. 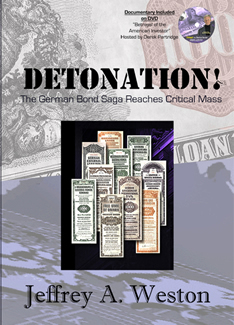 This book “Detonation – The German Bond Saga Reaches Critical Mass” discusses the depths of deceit, extortion and coercion that agencies of the German and US Governments have gone to in order to prevent collection efforts on these debts. This book also discusses the efforts of the brave individuals that have stood up to the tyranny and fought back to see that justice is done. This 2nd book includes never before seen documents found buried in dusty archives and among declassified Government documents. It serves as the second installment of the trilogy which will end with the exciting conclusion to this story in the final book to be called "The Aftermath". The readers of this 2nd book may have a direct influence on how the story comes out. This is history in the making and you may now become a part of it. Inside you will find out how.